The Western Front was more than 450 miles long and the British Army at one point occupied just over a hundred miles of it. Sometimes it is easy to forget the sacrifice of the French Army who held more than 300 miles of the front, or the more obvious fact the mighty German Imperial Army was holding all 450 miles on its side of the lines. The so-called ‘French front’ had many of its own landmarks but for France and Germany one of its greatest symbols would be Verdun. Here both nations bled in 1916 with more than 770,000 casualties. Fort Vaux was one of many static fortifications that came to characterise the battle; nearby Fort Douaumont fell to a handful of Germans but costs the lives of thousands of Poilus to retake. Fort Vaux was a more heroic story, at least in 1916. Surrounded, the besieged garrison under Commandant Raynal held on until food, water and ammunition all ran out. Raynal signalled his fate in a pigeon message delivered by the pigeon Valiant, which fell dead at the feet of the staff officers in the Verdun citadel once its mission was complete. 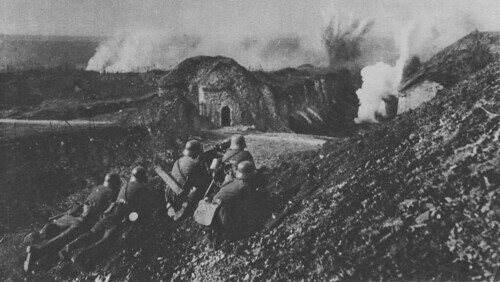 Fort Vaux fell on 7th June but it was a hollow victory for the Germans who casualties were verging on catastrophic for a battle in which they had hoped to ‘bleed France white’. Today Fort Vaux has been left in its wartime state and has an excellent museum. The pocked landscape that surrounds it reminds us of what once the whole Western Front landscape was like. This entry was posted on 12/10/2012 by sommecourt. It was filed under Battlefields, France, French Army, French Front, German Army, Great War, Verdun, Western Front, WW1 and was tagged with 1914-1918, 1916, Fort Vaux, French Army, French Front, German Army, Poilu, Verdun, WW1.